Good morning! 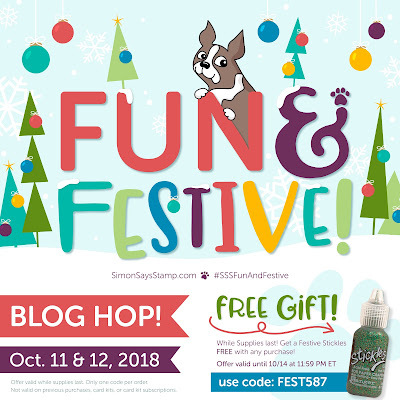 I'm thrilled to be hopping today to celebrate the BRAND NEW release from Simon Says Stamp called Fun & Festivec with a FABULOUS line up of talented creators! Today is Day 1 of the hop - make sure and check in tomorrow for Day 2 - there is a $25 prize up for grabs from EACH and EVERY stop along BOTH days of the hop!!! You should have arrived here today from Suzy Plantamura - if you just happened along, head over to the Simon Says Stamp Blog to start at the beginning! You may notice that in the graphic below that you can also get a FREE sparkly gift with any purchase by using the code FEST587! Today I used two of the fun new releases - Winter Scene and Tiny Words - to build this sparkly wintery scene on my card! And the second two scenes I stamped I cut out to layer and paper piece the hills together! 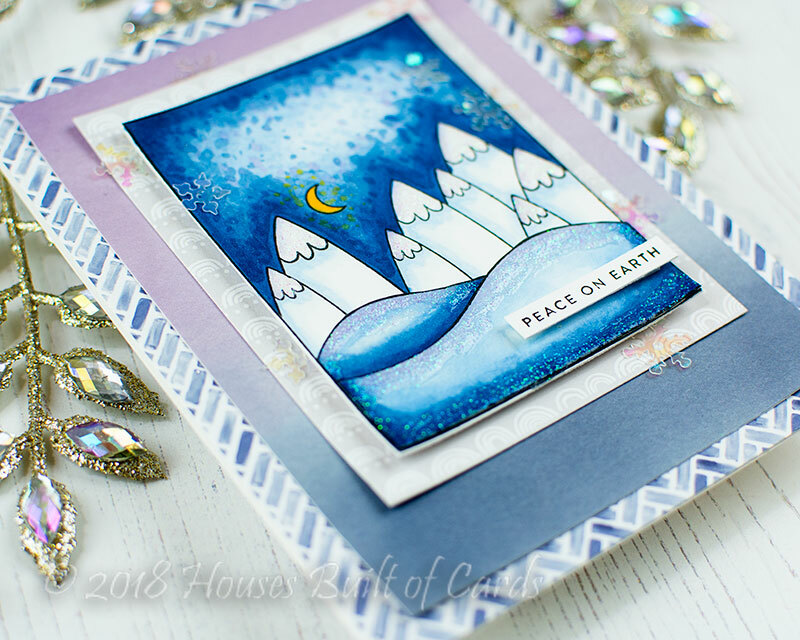 I colored each piece, then adhered them all together and added some sparkly Nuvo Glitter drops to the tops of the mountains and along the edges of the snowy hills. The pattern paper was an unexpected perfect match! It is the Pinkfresh Studio Indigo Hills 6x6 paper pad - the blues and purples were just right for layering with my wintery scene! As a final finishing touch, I added a few clear snowflake sequins, and stamped my sentiment on a strip of white cardstock to foam mount on the bottom of my scene. Hi Heather! Love your card. I always overthink things and would add too much. This is "simple" and beautiful. Wow Heather this card is so pretty, love the simplicity and the blue!!! Gorgeous! So peaceful and serene! That's such a beautiful winter scene. I love the simplicity of your winter scene. Very well done. Heather, the tranquility and beauty of your winter/mountains scene has sent my Christmas spirit soaring. I want to bundle up and go wander through these lovely surroundings. Thank you for the smiles and inspiration. Stunning card, perfect for this sentiment! Love your beautiful blue holiday card! This is beautiful! I love that gorgeous blue background against the pretty mountains! Love the card, just makes me smile! Love your card, love all the blues you used in this card. Thank you for sharing and inspiring. 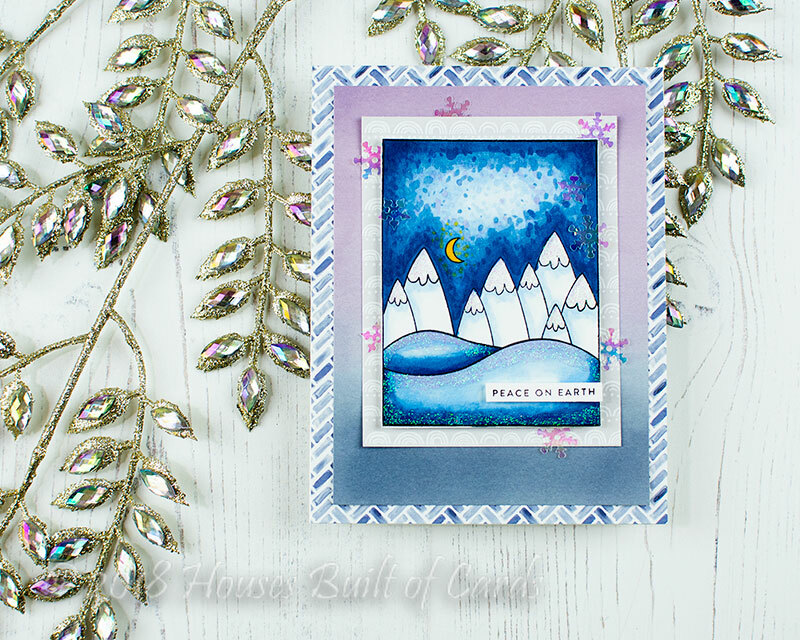 This card shows the versatility of the stamp set - a peaceful, calm, winter scene. The purple background paper really adds a lot to the feeling. Pretty card! I really liked that you paper pieces the background! Love this card as we received our first snowfall this week here in Utah! STUNNING!! Love your mountains, sky and the snowflake sequins!! Can't stop looking at your blues! Lovely! Fabulous card- the blues are beautiful! Love the sky you created for this card! Cute card! Cool new release! Pretty card! Love the tiny word stamp set. Beautiful card, it's such a pretty scene. It reminds me of when we take a drive up the mountain and come to an area where there is a fresh blanket of sparkly snow on the ground undisturbed. I love seeing snow like that. Thank you for inspiring me! gorgeous card - LOVE how you added the purple to it!! Snow much fun. Adorable scene. Pretty card and a great scene with the shades of blue! Long time no see! This is beautiful. It would be appropriate for Hanukkah, also. Fabulous release! So fun! Love your card, Heather, esp. the night sky. What a beautiful scene you have created. Like the CAS with style card. Ordered the stamp/die set & look fwd to receiving. Love the colors - what a beautiful scene! 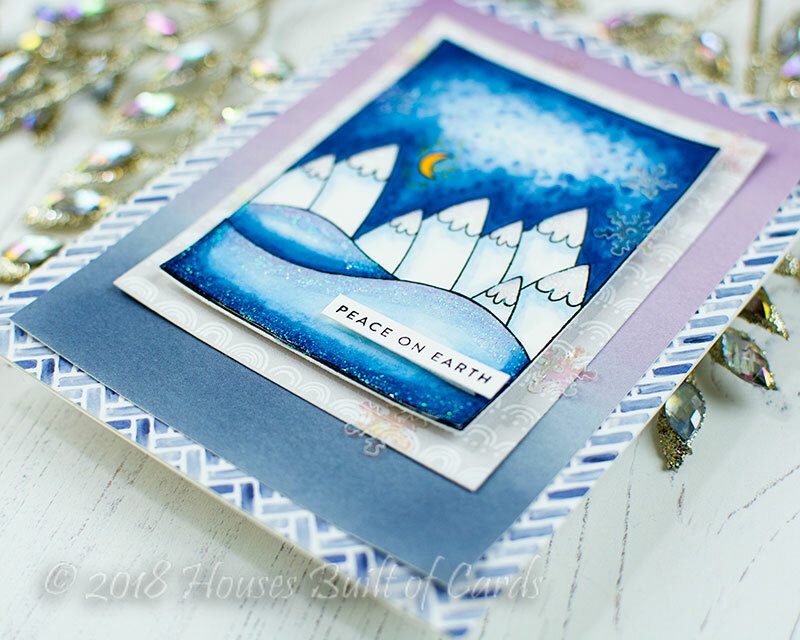 I love to use blues for holiday cards. Your card is so peaceful looking. Beautiful card. I'm thinking the colors are gorgeous together. How serene and oh so pretty! Love your card, and the lucky recipient will surely cherish it! What a calming, beautiful scene! Loving what you created with the products from this Super Outstanding Collection! What a lovely combination of elements resulting in a fantastic card! very scenery! beautiful card. love the different colors of blue that u used. very detailed. thank u for sharing. What a beautiful scene! I love the blues you used! Beautiful card, Heather! At first, I had no idea what stamp set you used. Then I realized it was the Winter Scene without the other images. I love how you just stamped the mountains multiple times and gave a completely different look to this set. Thanks for the inspiration! The colours of your scene are so lovely!! Lovely mountain scene on your card. What an amazing card! Super beautiful!! Beautiful scene. Love the different look you got from this stamp set. So happy I got on ordered. Love how you colored the background and it's transition from dark to light. The glitter looks great on those snowbanks! Love the blue. It is a nice and chilly looking scene. Beautiful card! So much depth! Love the framing of this peaceful mountain scene. Gorgeous! Love your mountain scene.....it really does feel peaceful! Nice and simple but striking and very cool! very pretty card with all the blues and sparkles. great stash builder, well used on a simple cool card. Adorable card!!! Love your colouring!!! That card is exactly what is in my mind when I think of winter. Beautiful! Your card is Super Sweet and Beautiful!!! What a beautiful, peaceful winter scene! Beautiful card! Such a gorgeous scene - love the sparkle! Lovely card!!!! It is a gorgeous, frosty, peaceful scene! Great card and beautiful colors. Your card is so pretty, love the color scheme, so tranquil. I love your design style and these cards reflect why I do! Great. card for those non-traditional people on my Christmas card list!! Just gorgeous!! Love the colors! A really refreshing and moving holiday card. Beautiful card. I love all of the glitter! Love this Fun & Festive release! Your scene is so pretty.... beautiful coloring! I've been waiting for this card after seeing a sneak peek on instagram! I LOVE this. The blues of the scene make you practically smell the cold in the air. And the "peace on earth" sentiment fits the scene perfectly. I just want to stare at it for a while and bask in the wintery perfectness. Thanks for sharing this really fun take on this stamp set! So pretty, Heather. I love those beautiful blues which make such a soft feel.Thanks so much for the inspiration! Really love how you colored this scene and the addition of a bit of sparkle too! Beautiful card! Your colouring always amazes me! Oh how pretty, love the different shades of blue and your sky is wonderful. Pretty card!! I really need to get those tiny sentiments!! Fantastic shading in the background. Love the hills. Great card. What a fun card! Love the mountains and colors! Your scene is so pretty! I like how you masked and layered the mountains. 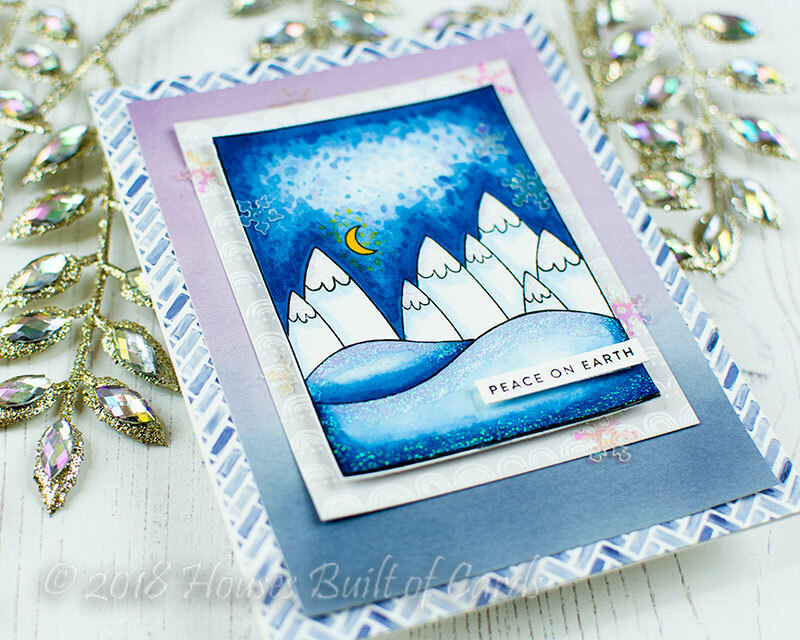 What a tranquil scene you have created with the moon, mountains, and snow! I really like it and you're definitely making me want this great new stamp set! 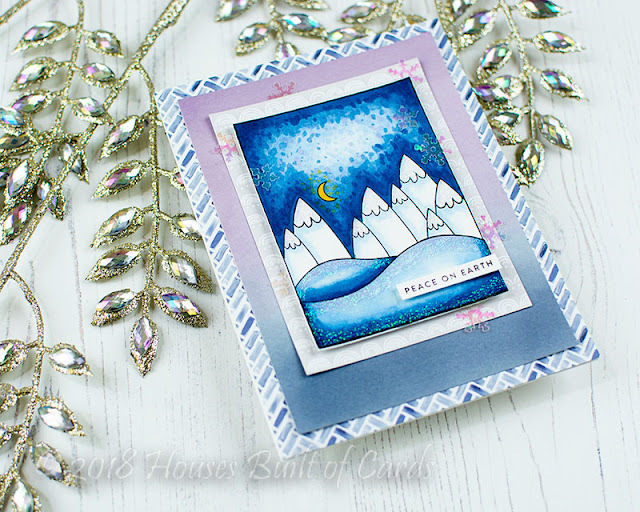 You’ve shown the true versatility of this stamp set while creating a card that has beautiful hues of blues and purple. Such a pretty card, love how you layered it and the masking technique you used ! Love the card you made with this stamp set, it seems so versatile. The layering is really fun. Gorgeous Heather I love it that all the awesome colours make the layers of the card come together. Thank you so much for sharing. So beautiful with the blues, I love it!! It looked chilly on my iPad!! The more I see all the ideas on how to use this set I really want to get that scene stamp now!!! What a beautiful winter scene. Such a beautiful card that brings a sense of peace and tranquility! The patterned paper as the card base is a perfect match and a lovely touch!! I often wish I saw more patterned paper used, not only as backgrounds and card bases but as accent pieces too. Thanks for the inspiration and stepping ooutside the box! Such a fun release! And I love the inspiration card! I love your card. It looks like a cold wintery night. I love the blues! !